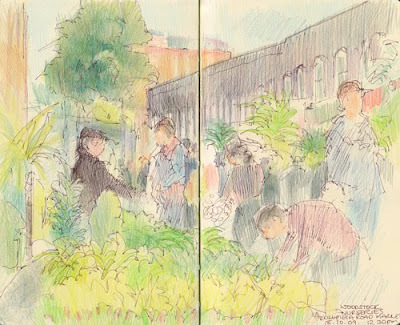 This is what I was doing last Sunday morning - sketching the people, plants and flowers around the stalls in Columbia Road Flower Market just off the Hackney Road, on the borders between Bethnal Green and Shoreditch. Every Sunday morning, at 4am a street market starts to be set up in Columbia Road. 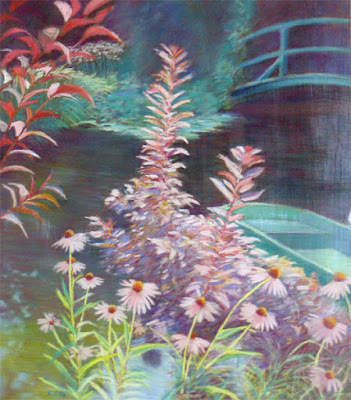 What's very special about this one is that it totally devoted to plants and flowers. 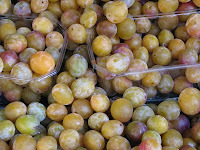 The website has a page devoted to some of the Columbia Road Flower Market traders and what they sell. Columbia Road is also lined with some interesting shops selling all sorts of things, many of them art and craft replated. This is a map which allows you to locate individual shops and galleries. The shop exteriors are certainly more interesting than many seen in a modern shopping street - it's one of the few streets I know in Tower Hamlets which still has old shop fronts - complete with shutters. See their background on their Twitter page to see what I mean. 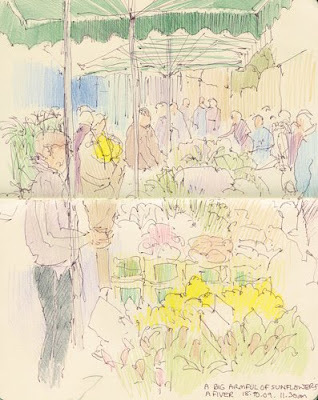 Which means it's a great place to sketch even when there isn't a flower market! The Columbia Road Shops and Flower Market also have a Flickr group - and I need to get my photos uploaded so I can join it! I find it ironic that I am writing this post at a time when I'm also spending a vast amount of my time working on a representation to Tower Hamlets Council explaining why their ideas about development and regeneration don't accord with those of the local population in the area where I live. This particular market would have been obliterated if the Planners had got their way! Now it is famous all over the UK (it gets featured on television programmes) as being a wonderful place to buy good quality plants and flowers at very reasonable prices. People come from all over London to visit it - although it's not the easiest place to get to (how to get to Columbia Road)! The whole area went into a decline in the 1970’s. Indeed demolition was mooted, but the locals fought back and the area and market were saved. Since the 1980’s the market has grown into one of international repute. Today a wide range of unusual shops complement it, turning the whole area into one of the most interesting shopping experiences to be had anywhere. "A big armful of sunflowers for a fiver!" I've included a sketch where the coloured pencil work is less developed (mainly because this was a standing sketch and the disability in my feet dictates a strict limit on how long I can stand still). it's exceptionally crowded from when it opens to when it close; the bulk of visitors arrive in the morning. standing inbetween stalls means you're out of the traffic flow either side of the stalls and should be OK so long as you don't take up permanent residence! try getting there very early or late when the crowds are thinner on the ground! or visiting in the week when you can see the shp fronts more easily. come with a big bag if visiting on a Sunday as you won't be able to resist either plants or flowers! While being green and using public transport is a good thing, getting home with masses of flowers and/or a six foot banana tree can be really rather difficult. The good news is that there is now a new car park for 200 cars in Haggerston School playground off northside of Hackney Rd. 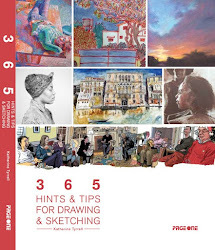 PS Sketches from my travels with a skdtchbook in France return soon - it's just I need to get a bit more work done on the content of the posts - including links to my videos! On Monday morning, the sun was shining, the sky was blue and we set off to walk across the very centre of Paris so we could visit some of the places my niece wanted to see. Here's our route (which seems to be misbehaving at the moment) - I said we walked a lot ! This is a link to a larger version of this map (where you can see the route!) of where we went - starting at the Place de La Concorde and finishing up at the Boulevard St Germain. After getting a good look at the Place de la Concorde and the view down the Tuileries in the morning haze, we started with the Musée de l'Orangerie. This is where Monet's famous large panels of waterlilies are located in two oval shaped rooms which were specially built to house them. 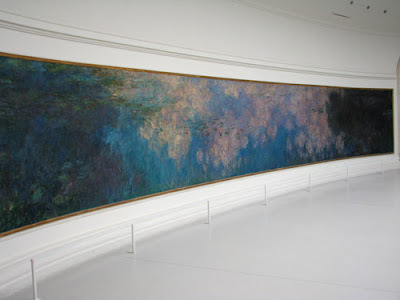 You can read more about them in Gardens in Art: Monet's final Nympheas. I should also explain that I'm very bad at sketching when I first get to a place in terms of the wide open spaces and big buildings. 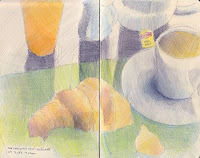 Small stuff - what's on my plate - I can cope with (hence what I sketched on Sunday). However big urban scenes need some time for my eyes to accommodate the different visual language of my surroundings. 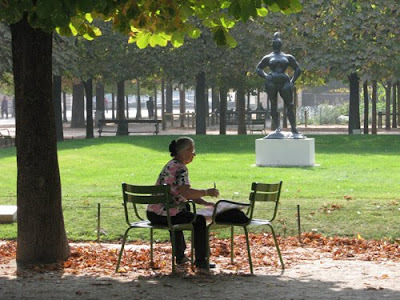 Even the parks and gardens look different in Paris. However for those of you who would like to go on a virtual journey I can provide you with sets of Photos on Flickr which I'll be linking to in my bullet point highlights below. we lunched at the fountains at the western end of the Jardin des Tuileries - see Jardin des Tuileries, Paris on Flickr. After lunch we walked through the Gardens towards the Louvre. We decided that the practice of having very comfortable but movable metal chairs in the parks was an admirable practice. Mostly because it enabled you to sit where you wanted to rather than where the park planners wanted you to. The Arc de Triomphe du Carrousel is at the easternmost end of the so-called Axe historique ("grand historic axis") of Paris, a nine-kilometre-long linear route which dominates central and western Paris. Looking west, the arch is perfectly aligned with the obelisk in the Place de la Concorde, the Champs-Élysées, the Arc de Triomphe and (although it is not directly visible from the Place du Carrousel) the Grande Arche de la Defense. we then had a debate as to whether to queue for Saint Chapelle and decided to go and see Notre Dame first and then return and see whether the queues had improved. This is my Flickr set for Notre Dame de Paris. I'd been reading about the carvings on the west front and took rather a lot of photos! Notre Dame also started a bit of a Joan of Arc trail we followed across France. after which we walked over the river to the left bank and in to the Latin Quarter of the sixth arondissement. Time for a little shopping followed by dinner at the Relais de l'Entrecôte Saint Germain - that's entrecote, frites and the famous 'green gold' sauce! By this time I was too tired to sketch plus although I got my sketchbook it out the service was too fast! Addicts of a "mythic entrecote", "crip, hot frites" and "secret-magic sauce" "stand in line" (no reservations taken) and sit "on top of each other" at these "outstanding" steakhouse "staples" in Saint-Germain and near the Champs; when ordering from the "friendly but no-nosense servers","rare", medium or well done are the only words you need to know" because the "reasonably priced" beef’s the only game in town here; but "when they have perfected this so well, why serve anything else?" Then back to the hotel via Metro - Châtelet where I really could have done without the massive underground hike to change lines - and so to bed to read my new book about Monet's Nympheas! Sketchercise: probably about 4+ miles altogether with more exercise than sketching! 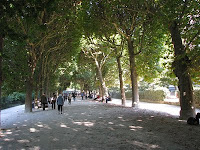 I wanted to see the Jardin des Plantes which is the botanical garden in Paris. So after Sunday lunch my sister and niece headed off to see some of the landmarks of Paris while I journied east of the Latin Quarter to the Jardin des Plantes. 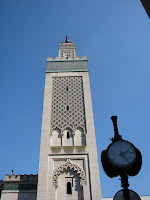 En route I spotted the Grand Mosque in Paris just as a lot of people of North African origin were arriving in their best 'going to mosque' clothes - which made for a very colourful scene. However not one which I felt was appropriate for sketching given Islamic thinking about the portrayal of people. I'm maybe spoilt by having the Royal Botanic Gardens at Kew for my local botanical garden but I couldn't help thinking that the Jardin des Plantes wasn't a patch on Kew. There again I guess a very large number of botanical gardens would struggle to compete with Kew! It did have a nice little potager and I loved the walks under the trees which seem to be a required feature of all the parks and gardens in Paris. The white (limestone?) shale covering of the ground makes for magical shadows! The flowers and other areas of planting were somewhat less impressive - although as Laura (Laurelines) predicted there were lots of dahlias around. However I kept reminding myself it was very much the end of the summer and the beginning of autumn. That said, when I got to Villandry later in the trip I saw an incredibly impressive French garden and what can be achieved with a bit of effort! One of the things I like about sketching is that you get to meet nice people! 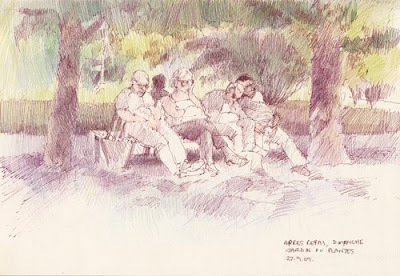 I sat on one of the seats under the trees and looked round for something to sketch. I spotted some people sat opposite me who seemed to be dozing and decided to limber up by seeing how far I could get before they woke up. Little did I know that they had spotted me sketching them! One of the gentleman came over to look and turned out to be English - so naturally everybody then came to have a look at the sketch. What was very funny was that both couples had been on the same Eurostar train as me and, just like me, were experiencing that dozy feeling in the middle of the afternoon when you've got up at 5.00am to catch your train! Having spotted me sketching them they decided not to move until I'd finished! It's not often I get such cooperative models! ;) The general consensus seemed to be that anybody knowing them would immediately recognise them from the sketch - despite the fact the sketches are about posture rather than faces! It turned out that two years previously they had rented a boat for accommodation when the 2007 Rugby World Cup was held in France and had moored it on the Seine not far away. They had used the Jardin des Plantes as their local garden! This time they were back to celebrate a significant birthday. So Jock and Jenny - here's your sketch and a larger copy of the original is about to be emailed to you! The afternoon was very warm and I made the mistake of forgetting to carry enough water with me. So before leaving I stopped at the cafe in the grounds and had a very expensive bottle of water. 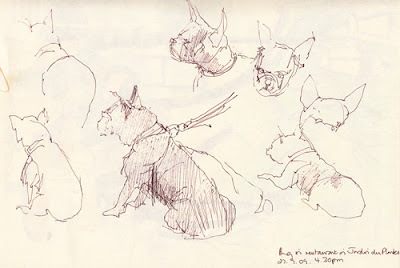 However I did get to sit down and sketch a super active dog at a nearby table which I thought might be a pug but I'm now inclined to think he was actually a French bulldog. 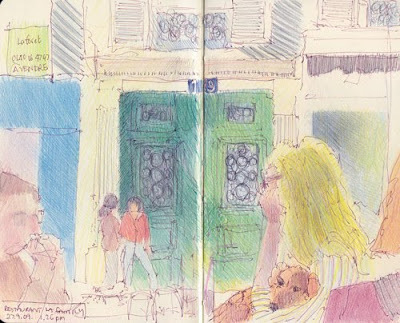 These very quick sketches took as long as it takes to drink a demi-bouteille! We didn't get off to a good start with French food on our first day in Paris - but that was partly because it was a Sunday. 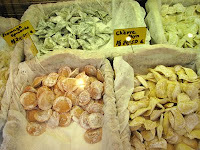 After we had left our luggage at the hotel, we walked up through the Sunday morning food market in the Rue des Martyrs - and I admired and photographed lots of the food as we walked. Thinking all the time that one of the huge bonuses of a holiday in France is the French food! However when we spotted a restaurant that we liked the look of we also discovered that their particular theme was international food - or as they put it "Le restaurant des cuisines du monde". Côté cuisine, toutes les recettes et les pâtes sont faites maison à partir de produits frais, naturels et de qualité, favorisant l’agriculture raisonnée voire biologique. What I liked was its emphasis on natural fresh and responsibly sourced food and what my niece liked was that it had a good range of pasta and noodle dishes - so with a hungry fifteeen year old to feed in we went! I got stuck into sketching as soon as we had ordered. 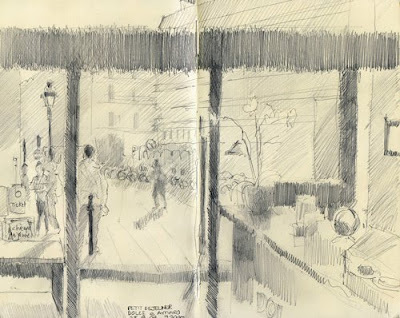 The sketch below was done during lunch as we sat near the window and ate our Pad Thai. Note the doggy participant! My sister (the dog owner) was amazed at dogs we kept coming across in restauarants in Paris. This particular one was sat outside beyond the huge open window doors. I got about 10% of my sister into this sketch! Noodles sautées au poulet et aux crevettes, Thaï chili pepper, pousses de soja, citronnelle, cacahuètes pilées et nuöc màm. Another bonus of this restaurant (for anybody familiar with trying to eat in France on a Sunday evening) is that it is open seven days a week for lunch and dinner (midi 12:00-15.00; soir: 19.30-23.00). Which explains why we were back there again in the evening for our second meal! We did look for an alternative - honest! Being a couple of minutes walk from the hotel also swayed in its favour. 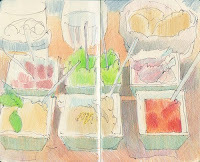 The sketch at the top of this post was done that evening when I tried the La Planche de 6 Tapas. Seriously it's a great little restaurant if you like places which lean towards organic and it can also be found in three other locations in Paris (addresses on the website). Last time I tried to catch an early morning Eurostar I managed to oversleep and leave myself with just 35 minutes to get from bed to the platform! This time - with two alarm clocks and an early morning wake-up call - I managed to get up at the right time to catch the train to Paris and everything was going swimmingly...........until we were locking the door and I realised I couldn't find the car key for "he who must not be bored while I sketch" ! You can imagine what happened next. Suffice to say key was found in a "really safe place" - in my purse - and I was driven to St Pancras International Station in recovery mode - heaving huge sighs of relief. My trip to France is with my sister and niece and the itinerary in terms of places has been largely devised by my niece. They're going to remain nameless as they're not huge fans of being online - just like 'must not be bored'. I'm going to have to come up with 'names' for them or else they'll end up being called sister and niece throughout all the posts! 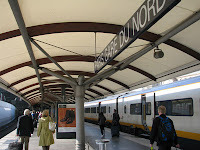 We caught the 7.52am Eurostar from St Pancras International Station to Paris Gare du Nord. Neither sister nor niece were enthusiastic about tunnels under the channel but the combination of time and money saved proved to be a considerable incentive - hence why we were on the Eurostar and why they spent a great deal of the journey with their eyes shut. Getting up very early might also have been a factor! It did mean that I got to chat with a very nice couple who got on at Ebbsfleet in Kent who were on their way to the south of France to meet up with their son who has a very interesting job as skipper of the The Who's classic sailing yacht! Who knew Pete Townshend was a big fan of yachts and yachting? I did another one of my composite sketches of northern France from the train - flat, fields of different colours interspered with trees. 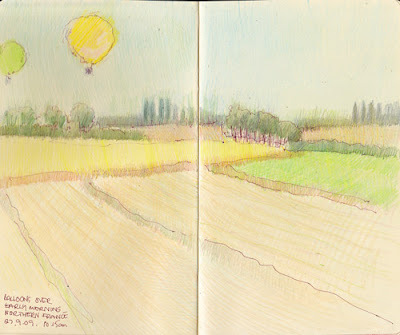 However this time the sketch gained an additional feature - low flying balloons! I also sat there trying to work out how to twitter with my mobile phone which I've not done before. Paris Gare du Nord makes for a bit of a contrast with the shiny new and gleaming St Pancras. The main difference being that Gare du Nord is the busiest station in Europe. Once you get off the Eurostar platform you are confronted with 'stuff' and signs everywhere. I don't think I've ever seen a more cluttered station in visual terms. We walked 15 minutes (downhill) to our hotel - the Hotel France Albion - which I can recommend. 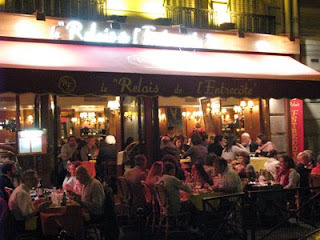 Although only 2 stars it was satisfactory and competitively priced for its location relative to central Paris. 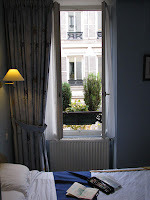 That said the twin room occupied by my sister and niece was small - but then that's the common theme to Paris hotel rooms! It made a particularly good base for exploring Paris as it's a very short walk to two metro stations (Line 7 (pink): Le Peletier and Line 12 (green): Notre Dame de Lorette) which both gave easy access to key destinations in central Paris. I also liked that it was in a 'normal' non touristy district. Postscript: The really odd bit of all this was I loaned "must not be bored" an anorak which I haven't worn for ages - and while I was away he found my second car key (which has also been officially 'lost' for ages) in the pocket. Weird or what? Today we'll be leaving Tours and the Loire Valley to begin the journey home. 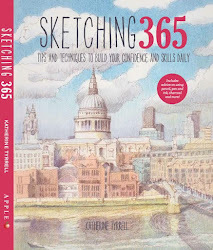 I'm not sure whether or not we'll have time for any sightseeing en route - but I'll be travelling with my sketchbook to hand! We're driving north initially alongside the River Loire to Paris via Orleans to leave the car at the Gare du Nord. My sister and niece will then catch the metro out to Paris Charles de Gaulle Airport (CDG) for their journey home. Tip: If using the Eurostar do inspect the prices for different times of day. By leaving a little later in the day you can save an awful lot of money! For those of you following my journey I hope you've enjoyed a virtual tour. When I get home I've got to go and log on and see how many comments I need to moderate! château on the Indre and the Loire. Here you arrive at one of the most beautiful gems of the Renaissance. Built under the reign of King François I, the Château of Azay-le-Rideau stands out in its watery setting, encircled by the Indre River, in which its beautiful facades are reflected. The Château is also surrounded by a park forming a screen of greenery around it. As to its architecture, Azay-le-Rideau offers the classic example of how Italian Renaissance influences were adapted to French styles. The grand staircase by itself is considered a masterpiece of design and construction. The Château de Villandry is renowned for its gardens. 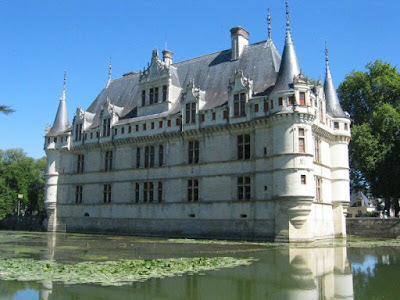 Completed around 1536, it was the last large chateau to be built in the Loire Valley during the Renaissance. We will be visiting the Château de Chenonceau. It has a quite stunning design and location! 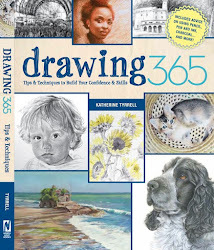 I'm hoping to get the opportunity to do a sketch - but I rather suspect there will be an awful lot to see! I've run out of time for blog posts so the rest of these - relating to our stay in the Loire Valley are going to be very brief. We're staying north of Tours which is the capital of the Indre-et-Loire department of central France. 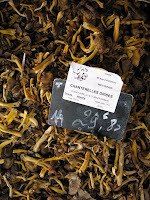 It gives it name to the Touraine - the region around Tours - which is well known for its wines. I feel a visit to a vineyard at some point might be a good idea. It has an interesting claim to fame! 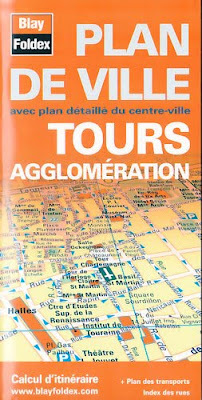 The inhabitants of Tours (Les Tourangeaux) are renowned for speaking the "purest" form of French in the entire country. 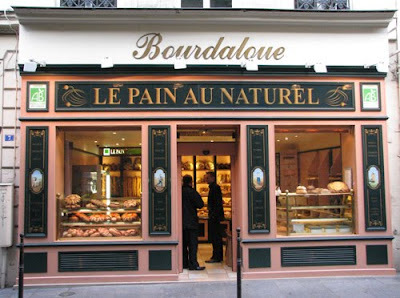 The pronunciation of Touraine is widely regarded as the most standard pronunciation of the French language, devoid of any perceived accent (unlike that of most other regions of France, including Paris). You canpractice your French by taking a look at the official Tours website! Or maybe just read the English version! 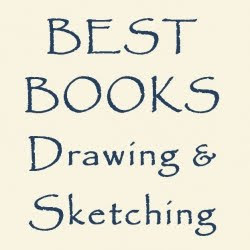 I'm hoping that this morning we can meet up with fellow Sketcherciser and Watermarks member Ronell van Wyk. You may know Ronell from her popular blogs African Tapestry, My French Kitchen and more recently Coin perdu, a mountain home. 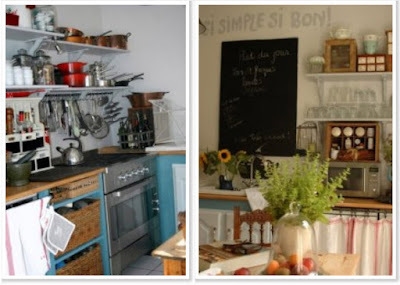 This means of course that I also get to see Ronell's french kitchen, her pantry, her herb garden and her atelier in Montlouis-sur Loire just outside Tours. 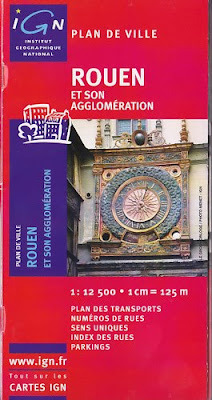 Ronell is promising to give us tips on what to do and see while we're in the Loire Valley - although my niece already has a schedule of what she wants to see of which more later this week. 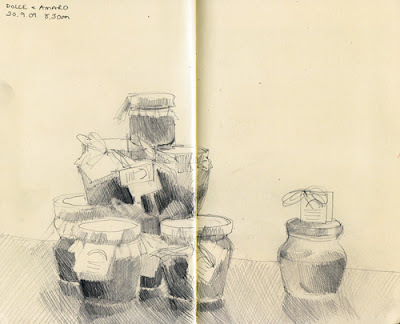 I think we're hoping to get a sketching trip organised plus I'm hoping we might be able to taste some of the food which looks absolutely delicious on Ronell's blog. 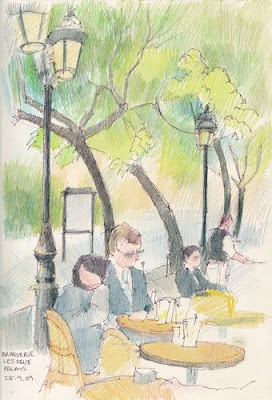 I think, given our status as two Sketchercisers and Watermarks bloggers there may be a good chance that take a brisk walk up the River Loire and then sketch it! However you're more likely to see what happens next if you visit her blogs! Today is our third day in Normandy in northern France. 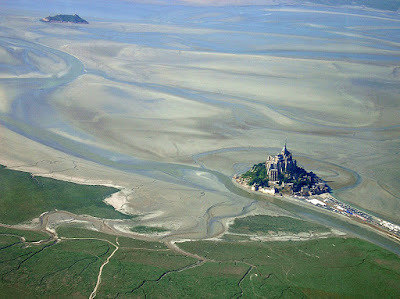 Le Mont-Saint-Michel is a rocky island off the coast of Normandy connected to the mainland by a thin strip of land which used to be covered at high tide. A Romanesque Abbey sits on top of the 'Mont'. Official Mont St Michel website. I think we'll probably be visiting Mont St Michel again in the morning. 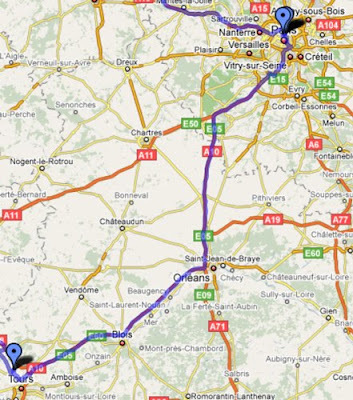 In the afternoon we'll travel 156 miles through Britanny - via Fougères and Laval - to just north of Tours. We're going to be staying in a self-catering cottage at Chateau du Plessis which we'll use as a vase for seeing various chateaux in the Loire Valley. Just got to work out where and when we buy breakfast for tomorrow! 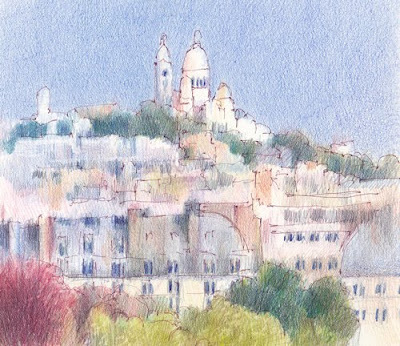 I'm actually planning on getting up early so that I can spend some sketching Rouen Cathedral. 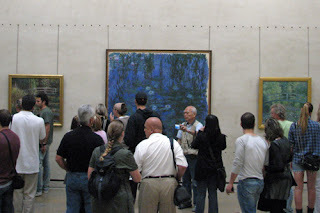 However I'm very mindful of the fact that Monet found that painting the cathedral's facade was extremely difficult. We're staying right opposite the cathedral in the Cardinal Hotel at 1, Place de la Cathédrale and if I'm really lucky I may be able to do all my sketches from my room! I do know that Monet took rooms opposite the cathdral while he was painting in Rouen. This morning we motor down through Normandy our next overnight stop at the Château de Boucéel so that we can visit to Mont St Michel. Today we're picking up a car from the Gare du Nord and driving to Giverny. 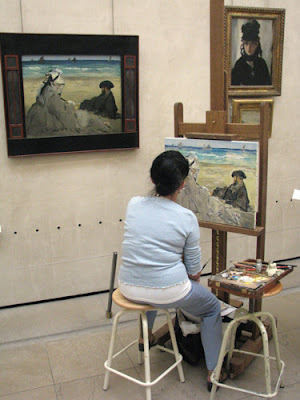 The aim is to visit the Foundation Claud Monet which is where you can see Monet's house, his enormous water lily studio, the Clos Normand (the flower garden) and the water garden, the Japanese Bridge and the Japanese Prints. I first saw the house and garden after a morning spent in the Musée de l’Orangerie viewing the huge panels of waterlilies which were of course based on paintings of his water garden - and it's in certainly in my top tend of best days ever! Giverny is also the place where Monet painted his series paintings of stacks of wheat which I wrote about in October last year on Making a Mark. Fortunately I constructed a list of links about Giverny and visiting Giverny two years ago when I was doing my Gardens in Art project on Making A Mark..
Report on a lecture entitled "A Site for Sight: Monet in His Garden at Giverny, and given by Michael Marrinan, associate professor of art and art history. 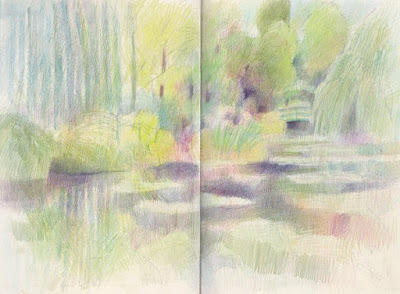 It focuses on changes in Monet's technique while painting Giverny. 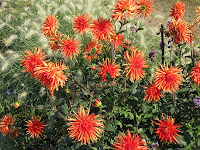 Giverny - a great garden is the site I created as home to information about the garden. 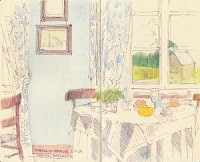 I'm hoping we will also get to visit the The Musée d'Art Américain in Giverny. It's open from April 1st to October 31, 2008 every day except Monday, from 10:00 a.m. to 6 p.m.